By Pamela Gwyn Kripke | 11 years ago Former American Idol contestant Jason Castro confronts Dreadheads and thousands of screaming fans during his return to Rockwall. By Tim Rogers | 11 years ago The Texas Rangers star is clean, sober, and crushing the competition. By Pablo Lastra | 11 years ago How a Mexican rodeo landed near tony Bluffview. By Sarah Eveans | 11 years ago London’s culinary offerings have expanded way beyond fish and chips. Here are some reasons to add eating to your next visit’s to-do list. By Philip Robison | 11 years ago Why Cathy Bryce should be our next state senator. By Zac Crain | 11 years ago Ed Butowsky goes to work on holidays. It’s not just because he manages $3 billion in assets for high-profile clients. It’s because he loves his job. By Stephanie Quadri | 11 years ago Indulge in your desire to buy fall fashion now. By Wick Allison | 11 years ago Want to keep the district as a job-protection racket? There’s only one way: get rid of Jack Lowe. By Peter Simek | 11 years ago The members of the Inferno take things too far -- and then keep going. By Marty Cortland | 11 years ago Our columnist explores the curse of poor restaurant seating. By Chris Meesey | 11 years ago A very patient review of Presbyterian Hospital cuisine. By D Magazine | 11 years ago Alligator, snake, crocodile—the textured look for shoes and accessories is in fashion. By Julie Blacklidge | 11 years ago Voignier picques our palate. By the editors of D Magazine | 11 years ago For you, dear readers, we present our annual roundup of all things that make our city great. It’s a tough job, deciding what you need to know to have best existence in Dallas, but for you, anything. By D Magazine | 11 years ago For three decades, professor David Freidel has hunted for Mayan treasures and brought glory to SMU. Now he and other archaeologists say drug traffickers threaten their work. But the truth behind the published reports don’t make for a Hollywood ending. 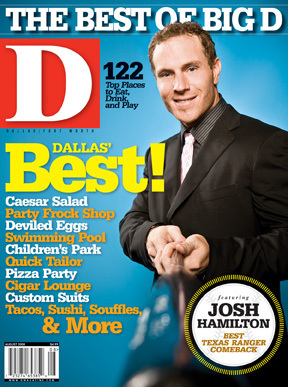 By D Magazine | 11 years ago You winnowed the 64 best things about Dallas down to your four favorites. Now it’s time to pick a winner. By D Magazine | 11 years ago D calls the odds on Mike Snyder’s replacement.